National Geographic: Europe’s Stone Age settlers migrated in waves that replaced older hunter-gatherer cultures, suggests a study that looks at European DNA, both ancient and modern. The results reported in the journal, Science, answer questions about the peopling of modern-day Europe. Project scientists, in collaboration with archeologists from Germany, have successfully sequenced and analyzed DNA from 364 individuals that lived in Central Europe between 5,500 and 1,500 BC. They extracted genetic material from teeth and bones and analyzed the maternally-inherited mitochondrial DNA (mtDNA). We all carry mtDNA which is nearly identical to that of a female ancestor that lived 500, 1,000 or even 5,000 years ago. And aside from occasional mutations, our mtDNA is static across time. Except, what the team discovered was that Central European prehistory was anything but static. What they found was that the shift in the frequency of DNA lineages closely matched the changes and appearances of new Central European cultures across time. In other words, the people who lived in Central Europe 7,000 years ago had different DNA lineages than those that lived there 5,000 years ago, and again different to those that lived 3,500 years ago. Central Europe was dynamic place during the Bronze age, and the genetic composition of the people that lived there demonstrates that there was nothing static about European prehistory. What we see in Europeans today is a kind of mixture of what was present there at different times in our past. So, just like parts of Europe today are melting pots from different living cultures across the world, Europe is also a melting pot of genetic lineages from different prehistoric cultures that lived there at different periods of time. Abstract:The processes that shaped modern European mitochondrial DNA (mtDNA) variation remain unclear. The initial peopling by Palaeolithic hunter-gatherers ~42,000 years ago and the immigration of Neolithic farmers into Europe ~8000 years ago appear to have played important roles but do not explain present-day mtDNA diversity. We generated mtDNA profiles of 364 individuals from prehistoric cultures in Central Europe to perform a chronological study, spanning the Early Neolithic to the Early Bronze Age (5500 to 1550 calibrated years before the common era). We used this transect through time to identify four marked shifts in genetic composition during the Neolithic period, revealing a key role for Late Neolithic cultures in shaping modern Central European genetic diversity. New ancient-DNA research led by the National Geographic Society’s Genographic Project, the Australian Centre for Ancient DNA (ACAD) and researchers from the University of Mainz in Germany and the State Heritage Museum in Halle (Germany) showed a pattern of genetic replacement taking place across several millennia in a region of central Europe. The genetic data reveal the complex dynamics that went into producing the present-day genetic patterns in Europe and show that the region that is now Germany saw at least four stages of significant migration and settlement, highlighted by marked shifts in the genetic composition of the populations in the region. One of the great debates in archaeological research for the past century has been the degree to which cultures or people move. When you see a pronounced cultural shift in the archaeological record, for instance, is it because of a new people appearing on the scene, or is it simply the diffusion of a new culture? 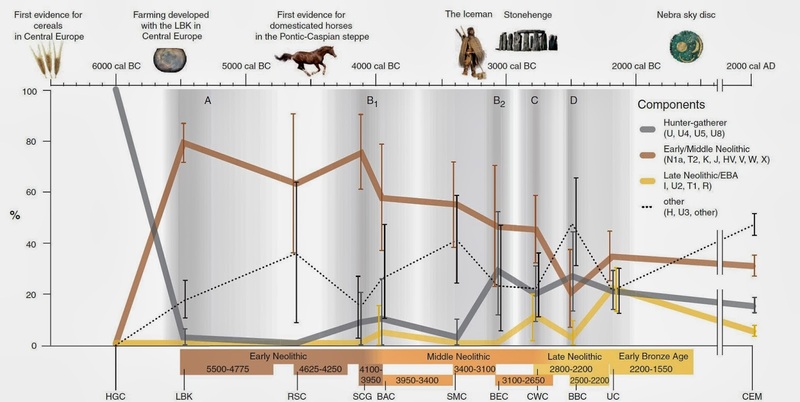 This new Genographic study shows definitively that, for Germany over a four-millennia-long time span from 5500 B.C. to 1500 B.C., it was people who were on the move, carrying their genes with them. Dienekes: You may follow the grey line to see how central Europe, once populated exclusively by hunter-gatherers, experienced a virtual disappearance of their matrilineages for almost two thousand years after the advent of farming. Then, between the Middle to Late Neolithic, around five thousand year ago, the hunter-gatherers make their re-appearance before their lineages converge to their modern (minority) frequency. The authors present a model of migration to explain these events, illustrated in a movie in the supplementary material, and also in the figure on the left. This entry was posted in AMH, Ancestors, Peopling the world and tagged Bronze Age, Central Europe, early migrations, Germany, Mitochondrial DNA, mtDNA, peopling of Europe. Bookmark the permalink.